Adventures trips such as hiking, hunting, camping, and climbing help people relax, while also giving them a healthy dose of adrenaline. The adrenaline rush coupled with the experience of discovering a new environment can rejuvenate dwindling energy. It’s crucial to be prepared when heading into the wilderness, as professional help is a long way away if someone gets hurt. In these situations, more than half of injured individuals are left untreated due to inaccessibility of medical service providers and the absence of a first aid kit. 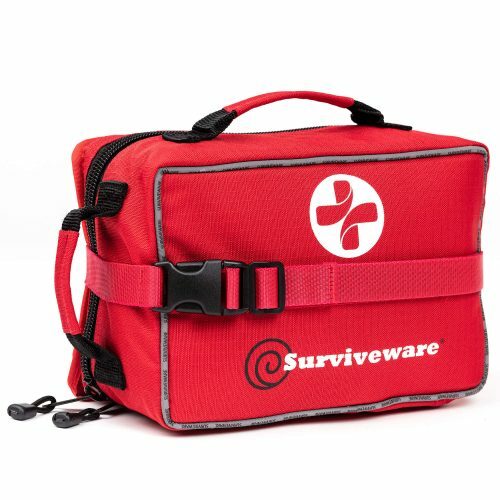 Surviveware, maker of high-quality adventure and survival gear, designed a first aid kit that covers the extensive needs of adventurers: the Surviveware Large First Aid Kit. This adventure kit provides a wide array of life-saving medical supplies that can be used to treat injuries small and large. Containing 200 pieces of first aid provisions, this first aid kit includes enough supplies to treat minor wounds and help stabilize the condition of those with critical injuries. This first aid kit contains a wide array of steri-strips, bandages, adhesives, gauze swabs, and non-adhesive dressing. It also comprises fever strips, sting relief wipes, hydrogel, and hypoallergenic tapes. Surviveware includes other first aid tools like splinter probes, nitrile gloves, tweezers, safety pins, and cold packs that can be used to treat and stabilize a wide variety of injuries. Moreover, the owners of Surviveware wrote a first aid handbook that is sure to come in handy. Apart from these provisions, the company also decided to include a detachable CPR kit and mini first aid kit that contains 50 pieces of first aid provisions. This additional item is essential, especially when going on adventure trips that require ultra-light packing. In addition, since this mini kit has a separate set of first aid items, owners don’t have to pull-out medical supplies from their main pack to furnish the portable kit. All 200 provisions are stored inside a 600D polyester bag. Unlike bulky plastic containers, this fabric casing provides versatility. It is also durable and can withstand pressure as well as rugged wear and tear. As the case is made from fabric, it is versatile enough to fit in awkward or tight spaces. To increase accessibility, Surviveware incorporated MOLLE-compatible straps and Velcro lining to this kit. This way, the kit can be attached to roll bars, headrests, bicycles, camp chairs, or hammocks. A favorite feature of the Surviveware first aid kit is its organized and labeled partitions. Each compartment has a label indicating its content and purpose- something that makes supply retrieval during emergencies easier. Be more confident when exploring the world with Surviveware’s Adventure First Aid Kit. More than just a brand, Surviveware is dedicated to providing high-quality products to all adventure seekers and survival enthusiasts. Grab a Surviveware Adventure First Aid Kit today for an exclusive 20% discount. Get one today and enjoy worry-free adventures. Order your kit now by clicking here.